Airstrikes in Iraq and Syria have the potential to disrupt ISIS by obstructing the physical links across its disparate operating areas. Degrading the military ability of ISIS to launch coordinated attacks across a wide area and limiting the ability of ISIS to launch new ground offensives is vital. However, these strikes do not operate inside a closed system. Observing how ISIS operates on its multiple fronts is key to understanding how airstrikes in one area affect the others. 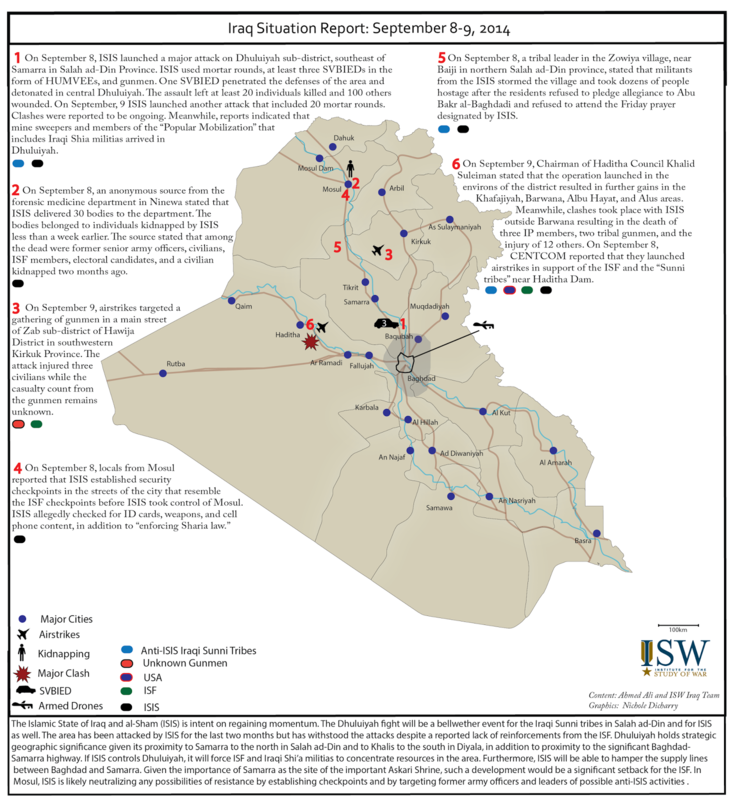 One of the primary areas where ISIS has been on the offensive in September 2014 is the Northern Baghdad Belts zone in Iraq, including strikes upon the capital itself. U.S. airstrikes have recently begun to target ISIS assets in this zone and it is important to anticipate how ISIS will react within Iraq’s capital region. Explosive attacks have continued in Baghdad throughout the summer. On September 4, ISIS detonated an SVBIED in Kadhmiyah, apparently aimed at civilian targets in Abdul Mohsen al-Kadhimi Square. Kadhmiyah is a predominantly Shi’a neighborhood housing one of Iraq’s most important shrines, and ISIS has attacked it often in order to incite sectarian mobilization. The ISIS attack on the Adala Prison in the Kadhmiyah military intelligence headquarters complex on September 18 marked an escalation in ISIS’s operations in the Baghdad zone. This attack was the first ground force attack upon a fixed military facility in the city since the fall of Mosul in June 2014. 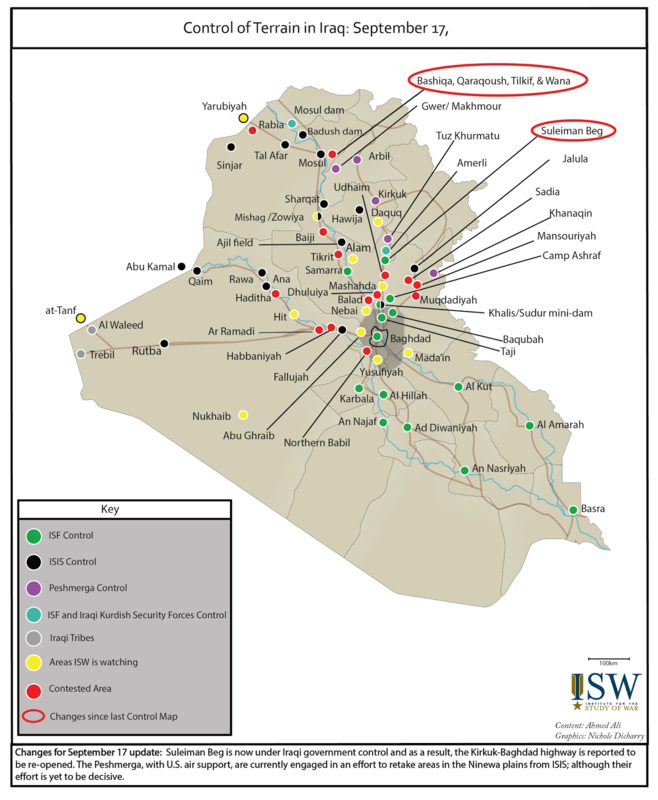 ISIS had attacked numerous prisons across Iraq during the 2012-2013 “Breaking the Walls” campaign, ending with the successful prison break at Abu Ghraib in July 2013. The complex combined arms attack against the prison in Kadhmiyah included mortars, an SVBIED, two SVESTS, and small-arms fire. ISIS detonated an additional VBIED at the office of the Badr organization in Iskan, western Baghdad. ISIS denied that the operation was an unsuccessful prison break attempt, but at minimum the attacks indicate that ISIS is exercising its ability to breach capital defenses at a concentrated point near a shrine in order to strike military and Shi’a militia targets. 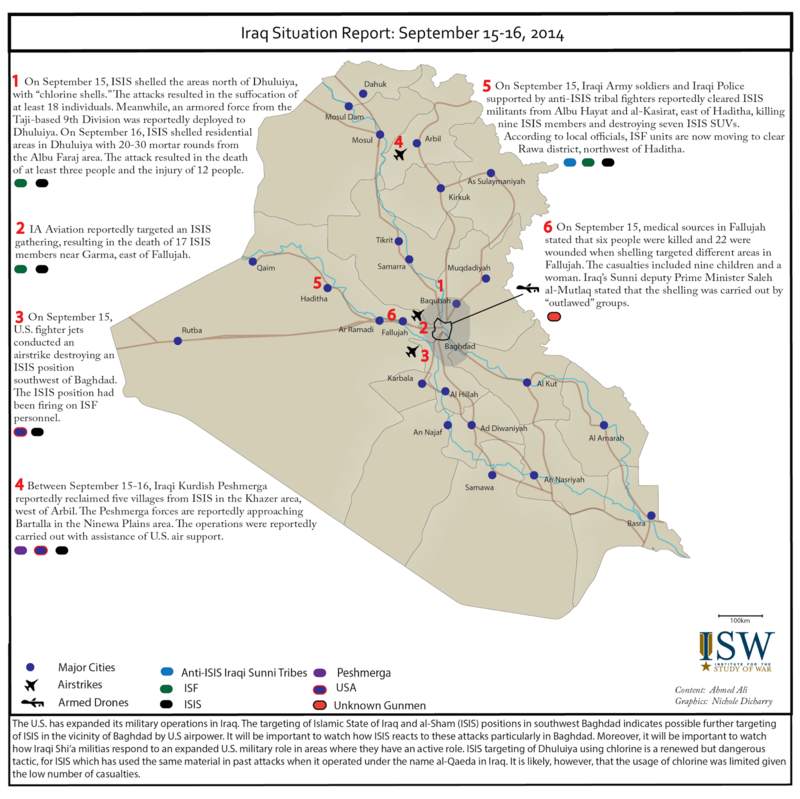 Indirect fire was also reported from locations north of Baghdad on September 15 and September 21. The use of indirect fire in the capital may indicate attempts by ISIS or other groups to attack Baghdad from a distance. Isolated indirect fire events may also constitute operational testing in support of future attacks. However, ISF defenses have increased in response to recent attacks. The ISF closed two bridges in central Baghdad after a VBIED detonated in the Karrada neighborhood on September 19. While airstrikes continue to escalate against ISIS positions in Iraq and Syria, ISIS may react by projecting greater force within the Baghdad zone. ISIS militants have also made repeated efforts to break the line of ISF defenses along the Tigris River which protect access to the northern Baghdad belts. On September 8 and 9, ISIS launched a two major attacks on the village of Dhuluiya, southeast of Samarra, involving mortars, three SVBIEDs, and two IEDs emplaced on boats. ISIS successful used another IED-equipped boat on September 13 to destroy the last remaining bridge to Dhuluiya, severing lines of resupply linking the ISF garrison to Baghdad and Camp Taji military base. 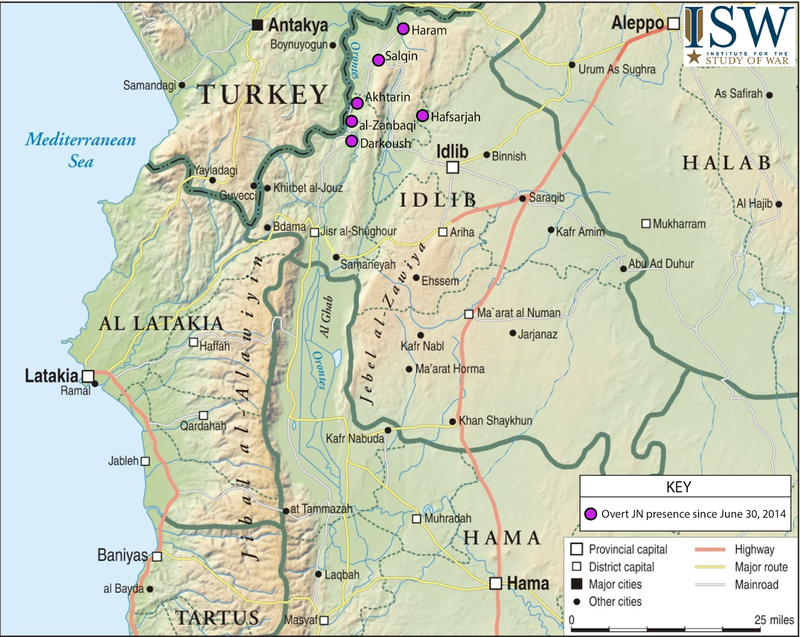 Extensive indirect fire on the area was also reported between September 11 and September 16, including a possible attack by chlorine gas shells on September 15. These actions marked a heavy escalation of force and were likely an attempt to prepare the ground for a future offensive by softening ISF fortifications. If confirmed, the deployment of chemical assets to the area conforms to a historical pattern of chlorine gas use by Al-Qaeda in Iraq (AQI) and may also signal the strategic importance which ISIS places on the northern Baghdad front. 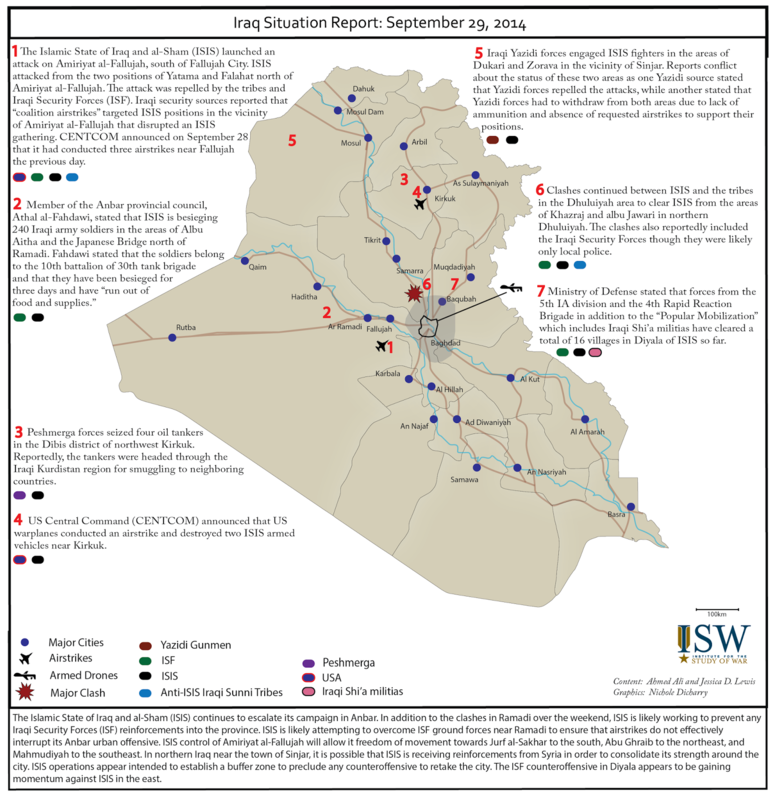 On September 18, ISIS launched another major attack on Dhuluiya which was repelled by local tribal fighters. As ISIS comes under increasing pressure on other fronts, particularly from airstrikes in Iraq and Syria, further pressure on the northern Baghdad system can be expected. Increasing levels of mobilization have been occurring behind this exterior line of ISF positions as well, in the vicinity of Taji, Balad, and Ishaqi. ISIS control of these areas would break the main lines of communication between Baghdad and forward-deployed ISF units in Tikrit, Samarra, and Dhuluiya. A chain of small-scale insurgent attacks, including roadside IEDs in Taji in September 14 and 20 as well as an attempt to kill a local Sahwa [Awakening] commander in Tarmiyah on September 22, indicate that ISIS maintained at least a low-level presence to harass ISF operations in the area. Following the Kadhmiyah prison break attempt, however, ISIS has visibly increased its force posture north of Baghdad. On September 21, ISIS launched a ground assault on the village of Dujail from four axes and has continued to apply pressure through daily attacks. ISIS forces also seized the village of Kaban in the Ishaqi sub-district on September 21, placing the neighboring village of Abu al-Sifa under siege. Dujail and Ishaqi both sit along the highway connecting the ISF units and Shi’a militias in Baghdad and Camp Taji with Samarra and Tikrit. Direct clashes also took place on September 23 in Tarmiyah, Mashahda, and Filahat, northeast of Camp Taji near the road to Baquba and al-Udhaim. 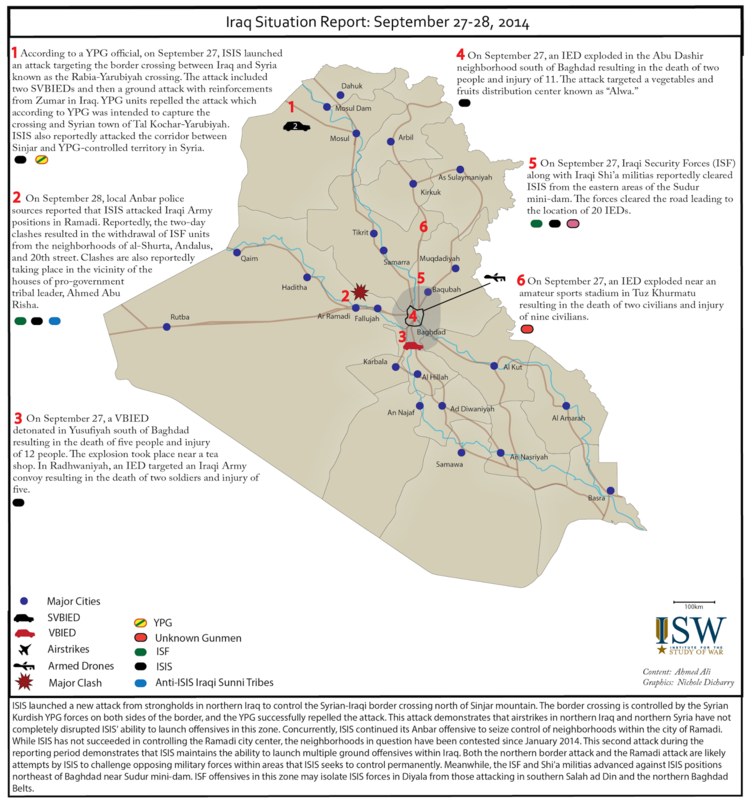 This series of attacks is a decisive step change in ISIS behavior in the northern Baghdad belt and may be indicative of an ISIS response to increased pressure in other areas. The manpower required to execute simultaneous ground offensives also suggests that ISIS has redeployed units from neighboring control zones or activated latent capabilities in the northern Baghdad belt. One potential source of these reinforcements is the neighboring Thar Thar region, which has been previously assessed as a zone of strong ISIS control. Another ISIS line of communication may run along the far bank of the Tigris River from the outskirts of Dhuluiya, through al-Dujma across the river from Balad, and on to Tarmiyah. From this area, militants could also travel across unsecured desert to interact with other ISIS systems in the Hamrin Mountains and Tikrit. In the western Baghdad belts, in the vicinity of Fallujah, ISIS has also expanded their operations in recent days. On September 21, ISIS militants overran an ISF military base in Saqlawiyah, northwest of Fallujah, after a multi-day siege, killing up to several hundred ISF members. Survivors reported that ISIS militants deployed an SVBIED and several SVESTs to breach the garrison’s defenses. The ability to concentrate and subsequently deploy a critical mass of forces in an active combat zone implies the presence of a nearby ISIS strategic reserve, likely located in the adjacent Thar Thar region. In conjunction with the attacks to the north of Baghdad, the location of the attack also suggests that ISIS elements in the Thar Thar area have been mobilized to cut ISF lines of communication to points in western Anbar, including Habbaniyah and Ramadi. The fall of the base in Saqlawiyah demonstrates the vulnerability of ISF positions on the outer Baghdad belt if ISIS efforts to isolate them from reinforcement and resupply are successful. Baghdad locator map with ISIS control, attack, and support zones. 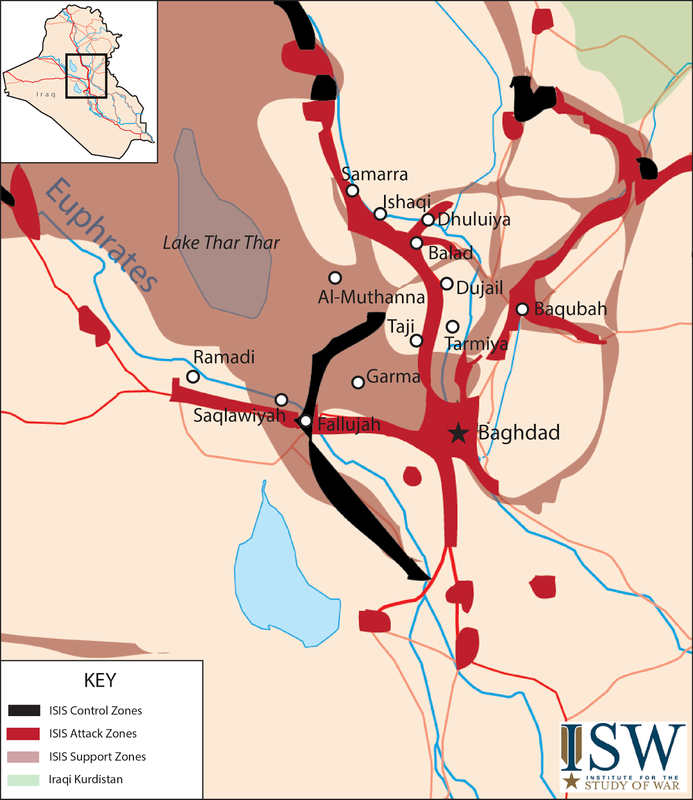 The Thar Thar region that stretches from Fallujah north to Samarra is a likely stronghold for ISIS, which took control of the Muthanna Complex there on June 11 - only a day after Mosul fell. 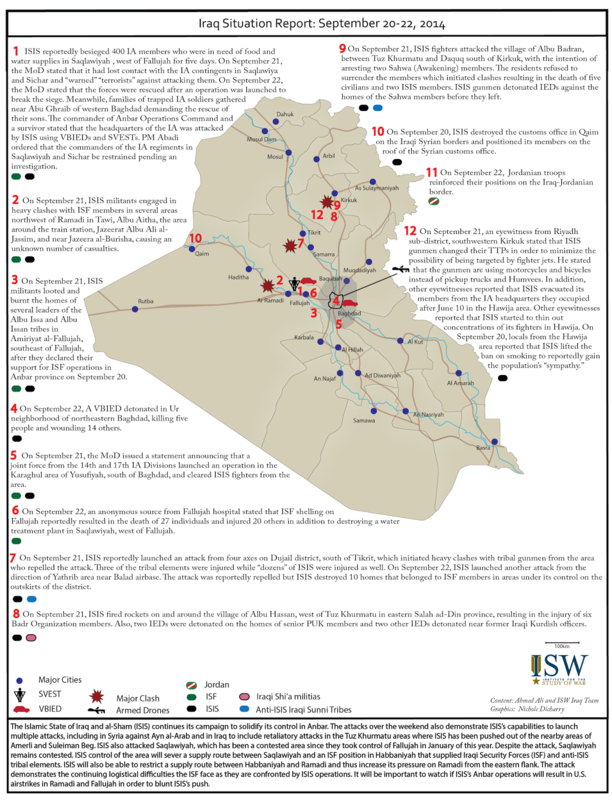 The ISF have increasingly targeted villages on the southern edge of the region, such as Garma, after ISIS entered Fallujah in December 2013, but the evidence indicates that ISIS probably maintains a significant force in this zone. This ISIS force, along with elements in the northern Baghdad Belts near Taji and Balad, are likely responsible for attacks in northwestern Baghdad. They also likely contribute to attacks upon Samarra, Dhuluiya, and Balad. 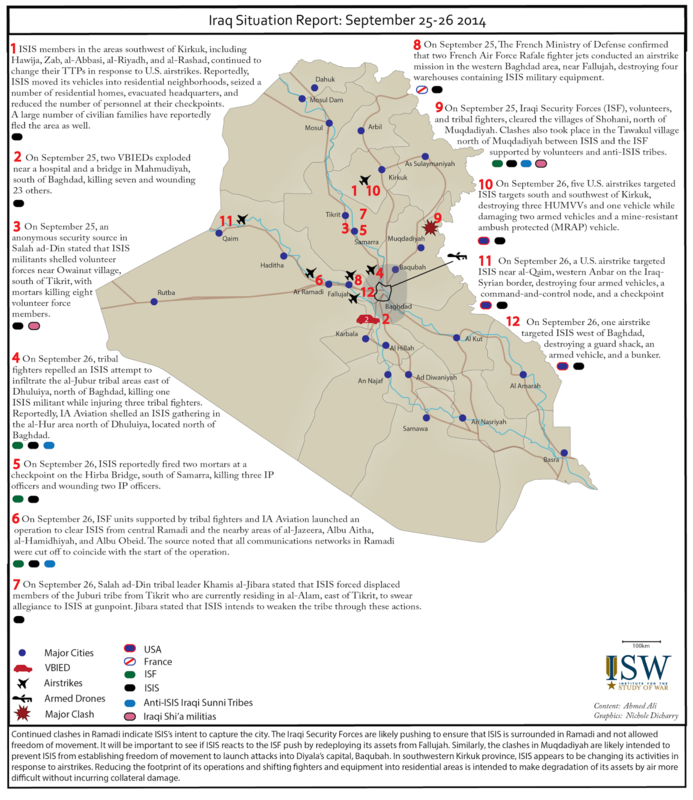 Combined with the ISIS force operating within Fallujah, this Thar Thar force was also likely responsible for the September 22 attack upon the ISF compound in Saqlawiyah, north of Fallujah. 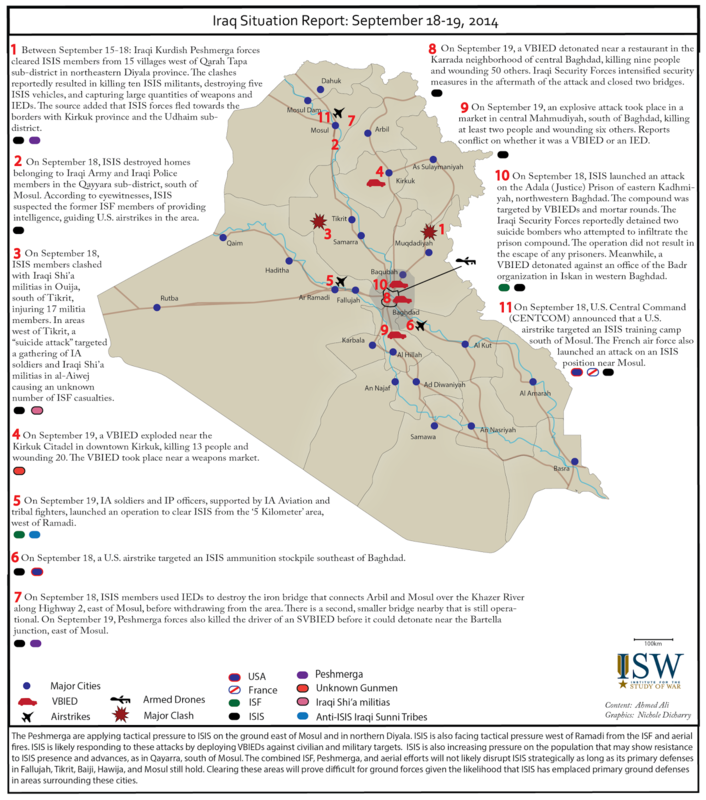 This force has been increasingly active in September 2014, a necessary reminder that ISIS still possesses the capacity to go on the offensive in the Baghdad zone. U.S. strategic planners appear to have recognized the threat posed by ISIS elements in the Thar Thar region. 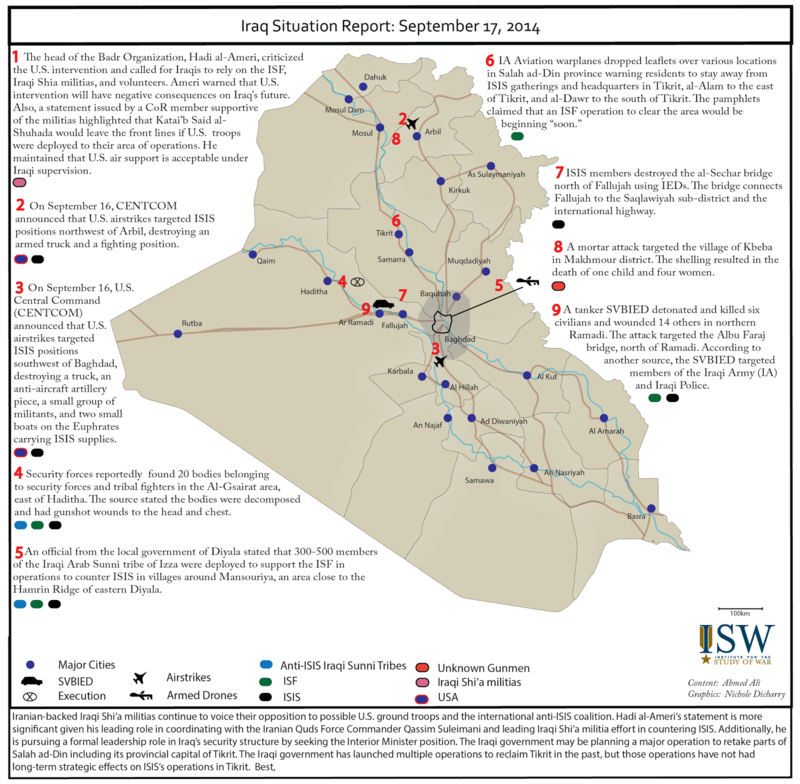 On September 23, one U.S. airstrike hit an ISIS vehicle northwest of Baghdad and on September 24 two additional U.S. airstrikes targeted ISIS armed vehicles to the west of Baghdad. These were the first strikes to be carried out in this area. A key measure for the effectiveness of these airstrikes will be whether ISIS can continue to mount further attacks forward of its primary control zones. An important instance of unity among counter-ISIS forces has emerged in Northern Syria, possibly galvanized by recent effective operations against ISIS in Iraq by local Iraqi forces with the support of U.S. airstrikes. 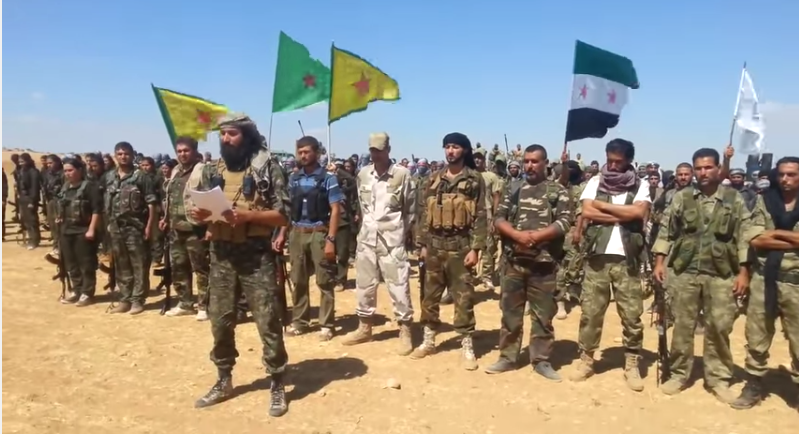 The Kurdish YPG, Jabhat al-Akrad [The Kurdish Front], and numerous FSA-affiliated rebel groups announced the formation of the “Euphrates Volcano” joint operations room in Northern Aleppo and Raqqa Provinces on September 10, the most significant rebel-YPG coordination to date. The video statement announcing the formation of the operations room declared the intent liberate to Qarah Qawzaq, Sireen, and Jarablus in addition to Manbij, Raqqa, and their surroundings, and called for material support from the international community in the fight against ISIS. The joint force appears to have immediately initiated operations against ISIS, claiming responsibility for a VBIED targeting an ISIS vehicle in the village of Qarah Qawzaq in the northeastern Aleppo countryside on September 11. A second VBIED in the ISIS-held city of Tabqa west of Raqqa went unclaimed, but is likely to have been conducted by groups within the operations room. The formation of a joint Arab-Kurdish operations room against ISIS in Northern Syria is a significant inflection that is likely to force a shift in ISIS’s calculus. Significantly, the YPG is also involved in the fight against ISIS near Azaz, where a rebel coalition including FSA groups, Jabhat al-Akrad, Jabhat al-Nusra (JN), and Islamic Front groups appear to have been initially successful in blunting the momentum of ISIS’s advance against a key rebel supply line near the Turkish border. Furthermore, in Hasaka province, the YPG has made a number of recent gains against ISIS. The YPG successfully recaptured the town of Jaza’a near the Iraqi border, which had been seized by ISIS forces on August 19. In addition, a YPG offensive against the ISIS stronghold of Tel Hamis is currently underway, and initial reports indicate a successful advance by the YPG. The Euphrates Volcano Joint Operations Room is an important case study for how the rebel landscape in a given area can be expected to interact with U.S. airstrikes against ISIS in Syria, if such airstrikes are to be conducted. Airstrikes alone are unlikely to be successful in defeating ISIS. However, it is possible that rebel action against ISIS on the ground may make considerable gains while ISIS forces are under pressure. While it is too early to examine the battlefield effectiveness of this joint Kurdish-Rebel force, clashes between the YPG and ISIS in the summer of 2014 provide a crucial lens into the force the YPG is able to bring to bear as a member of the new alliance. While they have taken notable losses, YPG forces have consistently been successful in resisting ISIS advances. Furthermore, activity in the months preceding the formation of the operations room sheds light on how ISIS is likely to perceive this new threat to its “border.” An instance of cooperation between YPG rebel forces against ISIS in Northern Syria in March provoked immediate aggression from ISIS, which moved quickly to reassert its control over its own critical terrain. The Syrian Civil War placed Syrian Kurds in a position of both extreme risk and unprecedented opportunity. Taking advantage of the regime’s decreasing control, Kurdish leaders from the Democratic Union Party (PYD) formed an armed wing titled the People’s Protection Units (YPG) with the intent of securing control of predominantly ethnic Kurdish areas in Northern and Eastern Syria. 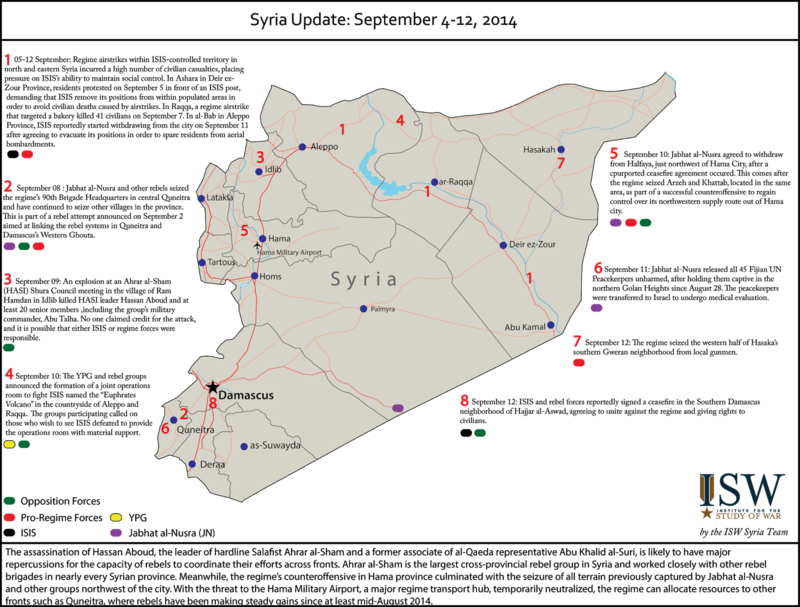 Throughout 2012, the PYD assumed administrative and military control over large parts of northern and northeastern Syria. However, the PYD continued to cooperate locally with the Syrian regime, and YPG forces have shared joint control with the regime over Qamishli and Hasaka cities. 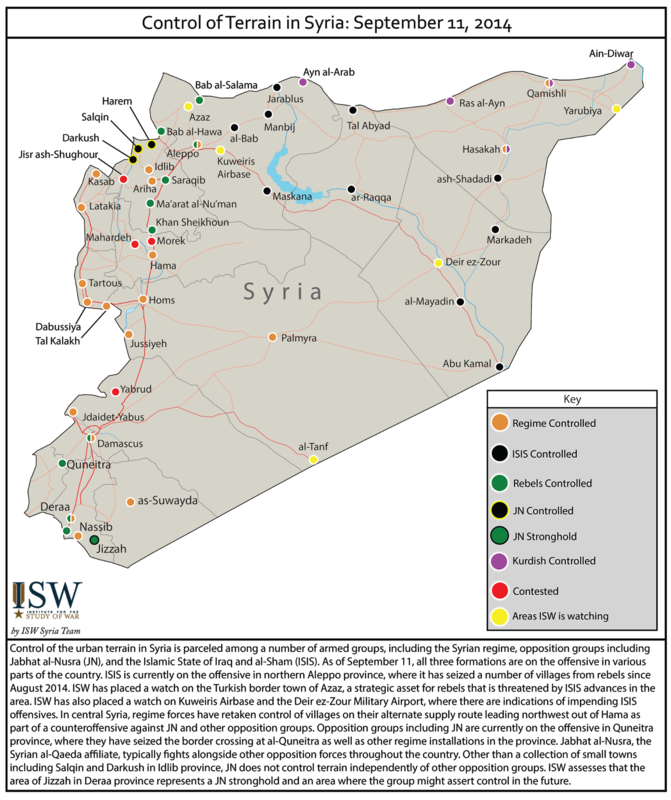 As a result of this cooperation, Islamist and rebel groups in Eastern Syria frequently clashed with the YPG, including prominent advances by JN, Islamist rebel groups, and ISIS deep into Hasaka province in early 2013. In a highly successful operation titled the Serekeniye Martyrs’ Offensive, YPG forces expelled JN and ISIS forces from the border town of Ras al-Ayn and its surrounding countryside in July 2013. During these clashes, the YPG proved itself to be a capable fighting force able to evict coalitions of rebel groups from predominantly Kurdish territory. The success of the offensive was closely followed by PYD’s declaration of the Self-Rule Transitional Government, which conferred de-facto autonomy to the Kurdish-majority “cantons” of Afrin and Kobane, in Aleppo province, and Jazira, in Hasaka province. Fighting between rebel forces and the YPG also occurred in northern Aleppo province. 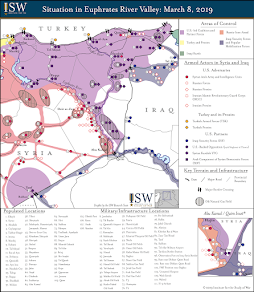 In August of 2013, a coalition of Syrian groups including ISIS, Ahrar al-Sham, Suqour al-Sham, Liwa al-Tawhid, and local groups from the town of Shuyukh announced that they were placing Ayn al-Arab under siege “to liberate the highway between Manbij and Hasaka from PKK [a derogatory reference to Kurdish forces by groups hostile to the YPG] checkpoints.” Nevertheless, rebel forces and the YPG were brought in alignment against ISIS in Northern Syria in the aftermath of the counter-ISIS offensive in January 2014 spearheaded by the Syrian Revolutionaries Front. 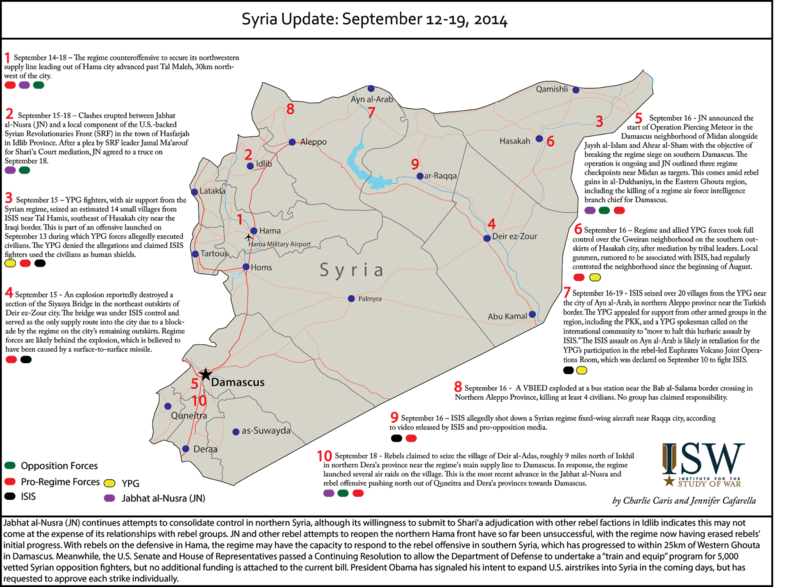 In the Spring of 2014, ISIS escalated hostilities against the YPG in northeastern Aleppo Province. The timing, geographical distribution, and intensity of ISIS attacks indicate three ISIS objectives. First, ISIS wanted to push back YPG positions in order to establish a buffer zone between the YPG’s area of free movement and the “borders” of ISIS’s infant Aleppo Wilayat [Governorate]. Second, ISIS sought to protect key terrain essential to the congruity of ISIS territory in Syria; specifically, the towns of Sarrin, Zawr Maghar, and Upper and Lower Shuyukh. Finally, ISIS sought to deter future YPG aggression against potential ISIS vulnerabilities surrounding the canton of Kobane. A decision by the YPG to join an attack by the Euphrates Islamic Liberation Front against the ISIS stronghold of Sarrin on March 14 appears to have provoked a shift in ISIS’s disposition toward the YPG and is likely to have encouraged the subsequent ISIS assault against the YPG in Northern Aleppo province. ISIS had seized the towns of Sarrin and Shuyukh Fawqani in the southernmost outskirts of the Kobane canton on March 10 and 11 respectively, allowing it to secure two major crossings north of the Euphrates and more effectively link its control zone north of Aleppo to those in northern Raqqa province. 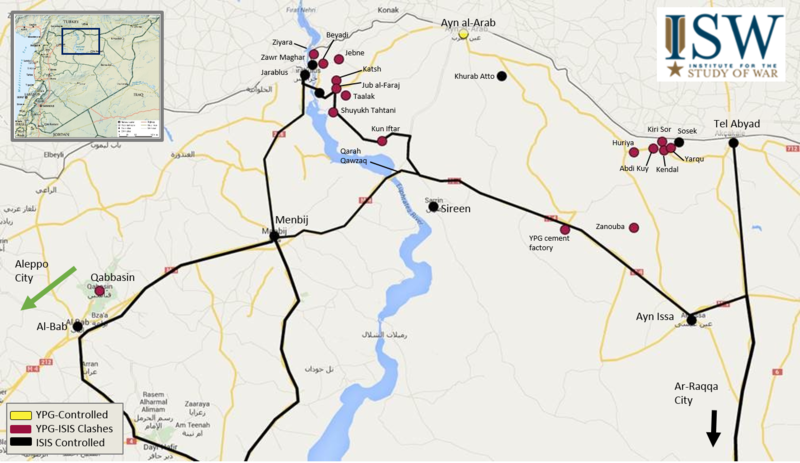 A strategically located town, Sarrin provides access to the Qarah Qozaq bridge and is therefore critical to ISIS’s freedom of mobility in the area. Wresting the bridge from ISIS control would have allowed the YPG and other rebel groups to cut an ISIS ground line of communication (GLOC) between Manbij and Tel Abyad, forcing ISIS to rely on a circuitous route south through the contested Tishrin Dam region. Likely seeking to relieve pressure near Sireen, ISIS forces based near Tel Abyad on the Turkish border in northern Raqqa province opened a second front against YPG forces in Kobane. As clashes west of Tel Abyad continued on March 29, ISIS launched its first of three nighttime raids on the town of Zawr Maghar, located just east of Jarablus on the Turkish border. A second attack on Zawr Maghar on April 3 prompted an alarmed statement from the PYD, calling the attacks “the most violent since ISIS began its siege on Kobane.” A third nighttime raid, rumored to have been staged from Khirab Ato, against Zawr Maghar was reported by the YPG on April 17 amidst continued ISIS shelling in eastern Kobane, the last major ISIS operation in the initial ISIS effort to encircle and contain the canton of Kobane in 2014. Reports of ISIS-YPG clashes in Kobane largely died down in early April, with local sources claiming the ISIS offensive had been thwarted. A YPG commander declared on April 19 that ISIS “not in a condition to advance now” and had been “entirely broken.” Overall, ISIS forces had been able to secure the valuable Qarah Qozaq bridge, but failed to decisively punish and deter the YPG. In fact, the YPG announced “a new resistance campaign against attacks” on April 25, launching immediate attacks against ISIS southwest of Ayn al-Arab city. More importantly, the YPG continued to support rebel groups fighting ISIS in Sarrin as late as May 1, clearly demonstrating ISIS’ failure to contain the YPG and prevent it from threatening critical lines of communication. By the beginning of May, the only ISIS aggression reported in Kobane were isolated firefights along front-line positions, other than ISIS’ brief capture of a hill that was reportedly quickly retaken by the YPG. After failing in its first attempt to deter the YPG through direct military action, ISIS changed tactics, launching a wave of kidnappings targeting the Kobane canton as well as groups of Kurdish civilians travelling through Aleppo province. On May 21, ISIS fighters abducted 15 Kurdish civilians from the town of Kun Eftar, located along the road between Shuyukh at Sarrin and reported to have been on the frontline between the YPG and ISIS. ISIS’s kidnapping campaign expanded significantly in late May, with ISIS fighters kidnapping 200 Kurds from the town of Qabasin in Aleppo province on May 30. It is possible that ISIS conducted these kidnappings with the intent of conducting swaps for captured fighters and remains. YPG spokesman Redur Xelil confirmed in an interview with McClatchy on June 21 that the YPG was “waiting for their demands to determine if there should be a prisoner swap.” Additionally, Kurdish journalist Multu Civiroglu suggested in an email sent to McClatchy DC that ISIS hoped to use the captured students as a “bargaining chip to pressure YPG.” However, it is also possible the attacks were simply punitive. The Guardian reported that over the following months ISIS tried to “brainwash” the captives and induct them into ISIS ranks, sparking intense fear within the Kurdish population. A second ISIS offensive against western Kobane began in late June. On June 23, the YPG and Kurdish media reported a renewed ISIS ground offensive on Zawr Maghar. On July 3, ISIS finally succeeded in capturing Zawr Maghar, which had been the target of ISIS attacks since March. A YPG statement published on July 4 announced the YPG’s withdrawal from Zawr Maghar, Bayadi, and Ziyara, temporarily granting ISIS a buffer zone. In addition to denying the YPG the ability to target Jarablus with indirect fire, the capture of Zawr Maghar allowed ISIS to broaden its offensive against the YPG, paving the way for ISIS’s capture of Bayadiya on July 6. Similar to its previous attacks on Kobane, ISIS opened a second front against the YPG staged from northern Raqqa. On July 8, ISIS attacked a YPG cordon around the village of Abdi Kuwi, east of Ayn al-Arab along the Turkish border, and detonated a VBIED against a YPG checkpoint at a cement factory on the road between Sireen and Ayn Issa. This ISIS front appears to have been successful, and the YPG released an official admission on July 9 that its forces had withdrawn from the villages of Kiri Sor, Afdouki, and Kendal as ISIS claimed to have broken the YPG siege of Abdi Kuwi following massive bombardment with tanks and artillery. However, YPG resistance continued. According to ARANews, the YPG recaptured Jubb al-Faraj, east of Shuyukh Fawqani, and Khirab Ato by July 6.. On July 11, the YPG announced an attack on ISIS-controlled Shuyukh Tahtani, situated along the road linking the key ISIS bridgeheads of Shuyukh Fawqani and Sireen. In mid-July, reports surfaced indicating that the PYD in the Hasaka “Jazira” canton had begun debating instituting compulsory service in the YPG, possibly for purposes of redeployment to Ayn al-Arab. However, the proposed law never came to a vote,, and instead upwards of 800 Turkish Kurds arrived from PKK training camps in Turkey to join the YPG’s fight against ISIS in mid-July. ISIS captured the village of Fiyunta in Eastern Kobane from the YPG two days after the arrival of the PKK reinforcements, but the fresh forces allowed the YPG to stabilize their defenses and begin to push ISIS forces back. On the western front, the YPG halted ISIS’s advance at the town of Jebneh, east of Bayadiya. By July 23, the YPG had recaptured the towns of Jel Oghlu and Darbazin, and took Katsh, Jabb al-Faraj and Kjel a week later, giving the YPG the positioning needed to attack the town of Shuyukh. The YPG attack on Shuyukh Tahtani was the climactic moment of the Kobane campagin. During the attack, 14 YPG and 35 ISIS fighters were reportedly killed in about 12 hours of fighting. The YPG did not take control of the town, but the takeaway was clear: the YPG could still place significant pressure on the Jarablus-Sireen GLOC and compel ISIS forces in Jarablus to detour around the Shuyukh Fawqani bridge. While sporadic clashes continued through August, these occurred on a much smaller scale with no major territories changing hands. By the beginning of September, ISIS had decisively accomplished one of its primary objectives and decidedly failed in the other two: ISIS had captured Zawr Maghar, pushed the YPG back from Sireen, and held onto Shuyukh, demonstrating ISIS’ ability to secure certain critical locations on the eastern border of its declared Aleppo region. ISIS failed, however, to create a buffer zone around Shuyukh or Zawr Maghar that would preclude subsequent YPG penetration into ISIS territory. 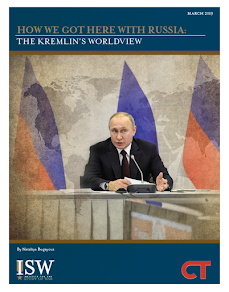 Analysis of the Kobane fight in the summer of 2014 reveals important aspects of ISIS strategy in Syria, indicative of an ISIS prioritization of continuity between its Syrian territories. It is clear that ISIS perceived the YPG to be a threat to important lines of communication that run close to the canton’s borders, and was willing to make a concerted effort to contract the YPG’s area of operations. 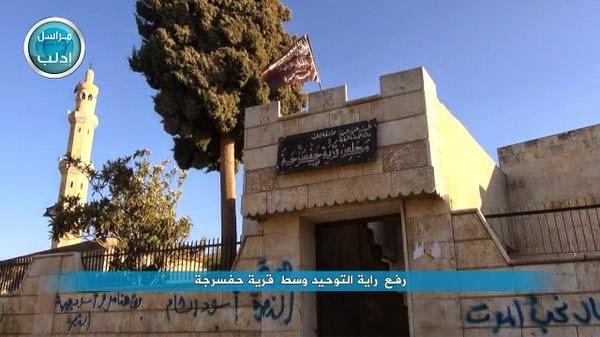 ISIS specifically mentioned the proximity of Zawr Magharto the city of Jarablus in a report it published on the attack, confirming that ISIS considered YPG control of the town to be an untenable threat to the borders of its declared Aleppo region. The failure of the first phase of the offensive in March and April revealed that ISIS’ forces in the area lacked the strength to consistently make significant gains against the YPG. However, after the Mosul offensive in early June, newly strengthened ISIS forces made important gains, inducing panic in the Kurdish canton. This increased ISIS strength was likely the result of newly acquired indirect fire capabilities acquired from weapons depots in Mosul, and possibly the deployment of veteran fighters to supplement those based in the Aleppo area. The ISIS attack on Zawr Maghar began with days of sustained indirect fire bombardment, distinguished from previous attacks that had almost exclusively consisted of nighttime raids. Testament to this inflection, a YPG statement published on July 4 claimed that ISIS fired over three thousand mortar shells at the town. While the veracity of this claim is impossible to verify, the extent of ISIS’s weapons seizures in Iraq has been well documented. Despite the reinvigoration of ISIS forces, the YPG was largely successful in defending its border against ISIS. The summer offensives therefore exhibit the ability of the YPG to resist ISIS gains, and to challenge the ISIS interior in a meaningful way. Newly united with rebel groups against ISIS within the Euphrates Volcano Operations Room, YPG forces are likely to contribute both effective fighters and critical staging capabilities that may lead to success against ISIS in the province. The joint operations room is a critical indicator of the possibilities for the formation of local counter-ISIS coalitions within Syria, and, if effective, may provide much-needed rebel momentum within the province. While insufficient to defeat ISIS, effective counter-ISIS action in Northern Syria may nonetheless encourage further exploration of local counter-ISIS alliances throughout Syria. However, the YPG’s participation has once again provoked a strong ISIS response. At the time of writing, an ISIS offensive against the Kobane canton has commenced and made sweeping initial gains. Thus the recent dynamics in Northern Syria illustrate that counter-ISIS movements face high risk in the short-term, and are likely to require additional assistance to be successful in resisting ISIS aggression. 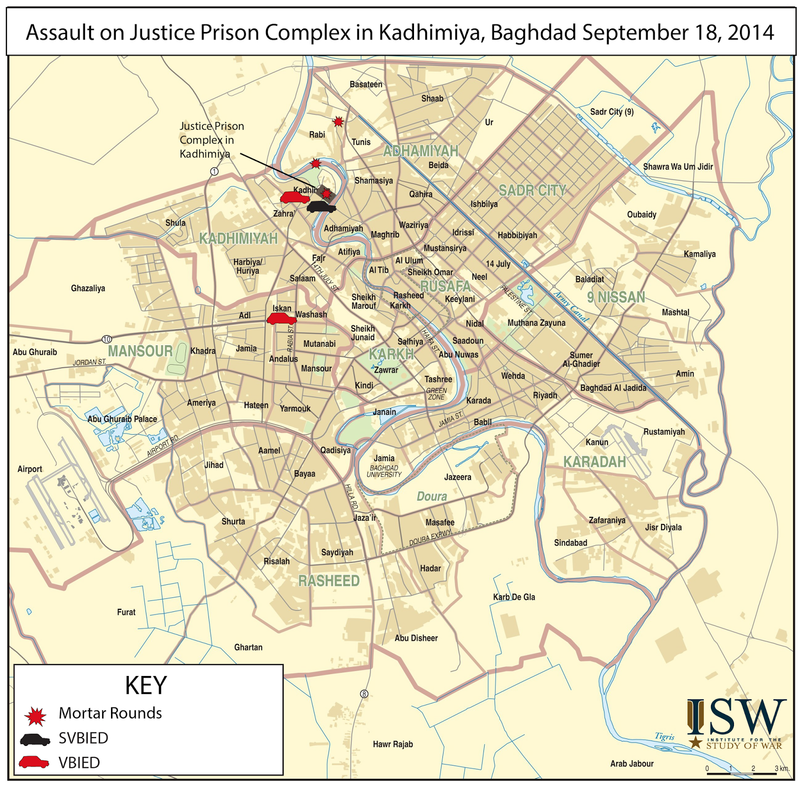 On September 18, the Islamic State of Iraq and al-Sham (ISIS) launched a complex attack likely targeting the Adala (Justice) Prison in Baghdad’s Kadhmiyah neighborhood in northern Baghdad. According to the Baghdad Operations Command, the attack was intendedto break into the prison but was foiled. ISIS also launched another attack in Baghdad’s Iskan neighborhood that likely targeted the offices of the Iraqi Shi’a political group and militia, the Badr Organization. ISIS’s attack included mortar rounds, Vehicle-Borne Improvised Explosive Devices (VBIEDs), and Suicide Borne Improvised Explosive Devices (SVBIEDs). The mortars were likely launched from the areas of the northern Baghdad belt including Taji. Fourteen mortar rounds reportedly targetedthe Adala prison and in the vicinity of Kadhmiyah, and other mortarrounds fell in the Greaat area in northern Baghdad which is adjacent to Kadhmiyah. An SVBIED also targeted the prison, resulting in the death of three people and injury of 10. Two attackers who had intended to attack the prison while wearing an explosive vest (SVEST) were arrested. Another VBIED exploded in a restaurant area in Kadhmiyah that resulted in the death of four people and the injury of 11 people. Iraqi police also defused yet another VBIEDthat was also found in Kadhmiyah. As a result of these attacks, security forces raised alert levels in Kadhmiyah. Security Forces also orderedcommercial shops to be closed in the predominantly Iraqi Sunni neighborhood of Adhamiyah. Adhamiyah lies just across the Aaima bridge from Kadhmiyah. Elsewhere in Baghdad, a VBIED detonated in the Iskan area in western Baghdad. The VBIED targeted the office of the Badr Organization, a Shi’a militia organization that has taken a leading role in directing Iraqi Shi’a militia operations to counter ISIS. This attack is very significant. It is the first infantry-like, complex, and penetrating attack in Baghdad city by ISIS since the fall of Mosul in June of this year. ISIS likely carried out the attack to release some of the pressure it is facing as a result of the recent U.S. air campaign targeting its positions. The attack also signifies that, despite the heightened defenses of Baghdad in the aftermath of the fall of Mosul, ISIS is still able to carry out attacks in an area where it is unlikely to have active sleeper cells given Kadhmiyah’s predominantly Iraqi Shi’a demographic. The mortars were likely launched from Taji due to ISIS’s historical presence in the area and its ongoing activitiesthere. The attacks will not likely divert great deal of resources of the ISF and Iraqi Shi’a militias into other areas. The government will want to maintain a strong defense of Baghdad by preserving the same posture. More likely, however, the attacks will trigger increased activities of Iraqi Shi’a militia in Baghdad in order to target ISIS sleeper cells and predominantly Iraqi Sunni areas including Adhamiyah. On September 15, Iraqi Shi’a militias issued statements concerning any further involvement by U.S. military personnel in Iraq or neighboring countries. The groups included the Sadrist Trend, which has fully reactivated its Mahdi Army under the banner of the “Peace Brigades,” Asai’b Ahl al-Haq (AAH), and Katai’b Hizballah (KH). Both AAH and KH are supported by the Iranian government while the Sadrists have had more complex relations with the Iranian government. 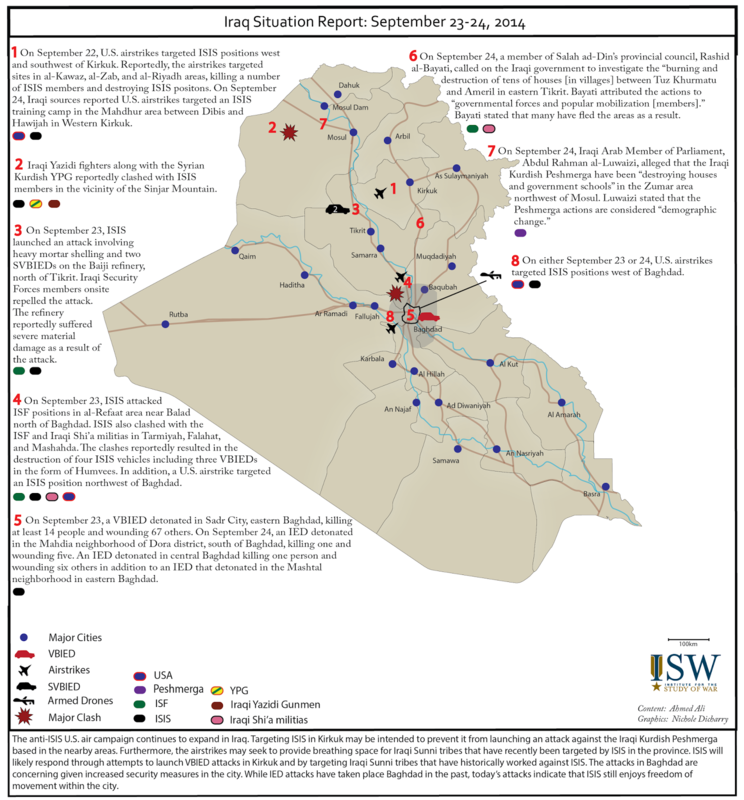 The three groups, along with the Badr organization, have also had a forward-deploying role in the Iraqi government’s ground campaign against the Islamic State of Iraq and al-Sham (ISIS). The role of KH and AAH has been coordinated with the Iranian Revolutionary Guard Corps (IRGC) Quds Force (QF). The Peace Brigades have avoided public association with the Iranian government and may be coordinating with QF to a lesser extent in comparison to AAH and KH. These statements are a reaction to President Barack Obama’s speech last week announcing the U.S. effort to counter ISIS. Furthermore, they represent an Iranian government position against the anti-ISIS coalition that the Administration is consolidating, which has not included the Iranian government. In short, the Iranian government is replicating its strategy before the withdrawal of U.S. Forces in 2011 by directing the militias to attack U.S. forces and presence in Iraq. Furthermore, the Iraqi Shi’a militias want to maintain their influence, and the presence of U.S. forces will result in limiting their influence. Iraq’s Shi’a militias will have to acknowledge the active involvement of U.S. and other western countries in breaking the siege of Amerli. They will also have to contend with expanded U.S. air support that has included areas south of Baghdad on September 14-15, both of which support the Iraqi government against the threat of ISIS. It will be important to watch how the Badr organization will react to these statements given its close ties to the Iranian government and Badr’s desire to occupy one of Iraq’s security portfolio ministries of either Defense or Interior. 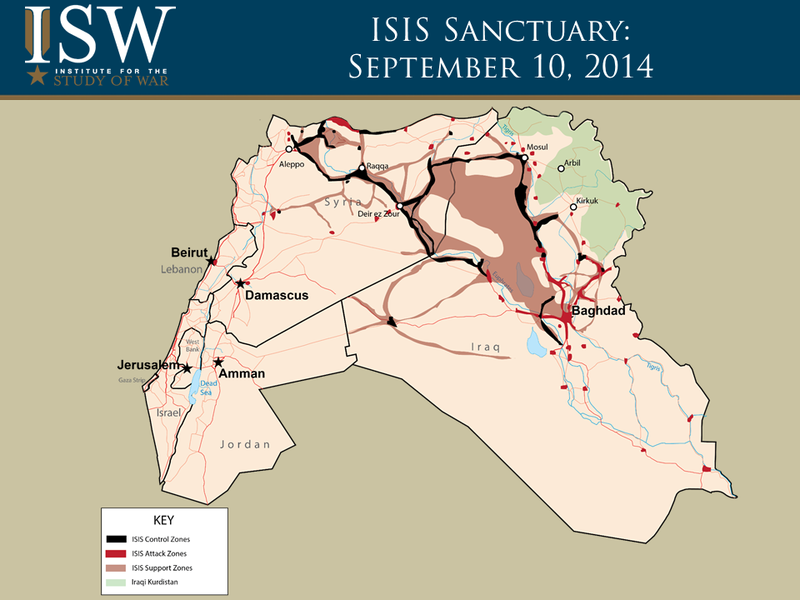 ISW has updated its ISIS Sanctuary map in advance of President Obama’s speech on a strategy to confront ISIS. This map, covering both Iraq and Syria, shows the extent of ISIS zones of control, attack, and support throughout both countries. The Iraqi Council of Representatives (CoR) has voted to install a new cabinet to form the government of new Iraqi Prime Minister Haidar al-Abadi. The new cabinet will face the challenges of altering a deteriorating security situation and overcoming the mistrust created by former Prime Minister Nouri al-Maliki's years in office. Crucially, the government will also have to reverse the gains made by the Islamic State of Iraq and al-Sham (ISIS). However, the vote for the new cabinet did not include the important positions of minister of defense or minister of interior. These positions will for now rest with PM Abadi, as former Prime Minister Maliki had occupied the positions previously. Hadi al-Ameri, of the Iranian-backed Badr Organization, has been floated as a candidate for both positions, and it is likely that political wrangling over these positions has delayed their appointment. Such an appointment would be alarming to the United States and other Iraqi allies. Iraqi Sunnis are likely to receive the Ministry of Defense, which may help instill confidence in renewed military efforts against ISIS. Much rests on the timely filling of these positions, which PM Abadi has promised this week. Iraq's government will be led by newly elected Prime Minister Haidar al-Abadi, a member of the Iraqi Shi’a Dawa Party. He came to office after former Prime Minister Nouri al-Maliki stepped down from running for a third term in the office. Today’s voting included twenty-four ministries, excluding the important security portfolio ministries of Defense and Interior. In addition to the cabinet positions, the CoR voted on three vice presidents. All three are leaders of political groups that competed in the 2014 elections: former Prime Ministers Ayad Allawi and Nouri al-Maliki and former Speaker of the CoR Osama al-Nujaifi. The Vice Presidency is more of a ceremonial position and does not have specific political powers. With former Prime Minister Maliki remaining in a political role, it remains to be seen how other political players will react. The cabinet also maintained other well-known politicians in other positions, including the ministries known as the “sovereignty ministries:” Defense, Interior, Finance, Foreign Affairs, and Oil. Adel Abdul Mahdi from the Iraqi Shi’a Islamic Supreme Council of Iraq (ISCI) will be the Oil Minister, former prime minister and Iraqi Shi’a politician Ibrahim al-Jaafari will be Foreign Affairs Minister, and former deputy prime minister from the Kurdistani Alliance Rozh Nouri Shawes will be the Finance Minister. The Defense and Interior ministries remain pending. Filling the positions of Defense and Interior Ministries. According to Abadi, he will seek to fill these positions by next week. Previous minister of transportation and leader of the Iranian-backed Badr Organization, Hadi al-Ameri, has controversially been reported as a candidate for the Defense Minister position but later leaks and unofficial cabinet lists showed him to be the candidate for the Interior Ministry. It is likely that the delay in filling both positions is the result of al-Ameri’s history as an ally of the Iranian government. 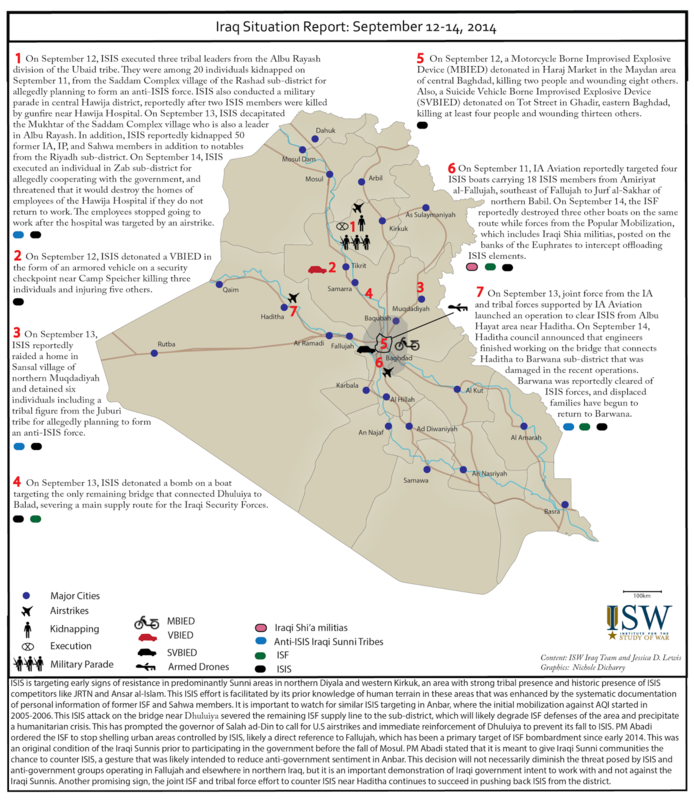 Iraqi Sunnis and Security Positions. During the formation of the government in 2010, the Iraqi Sunnis were supposed to receive positions within the Defense Ministry. Former Prime Minister Maliki, however, withheld these positions and occupied them himself. Leaks from the government formation process again indicate that Iraqi Sunni political groups be granted positions in the Ministry of Defense. The Iraqi Kurdish Position. The Iraqi Kurds conditioned their participation in the government on six conditions that have to be fulfilled within three months. The conditions include addressing outstanding oil and gas issues, Iraqi Kurdistan’s share of the federal government budget, Article 140 (pertaining to disputed internal boundaries), further discussion of the government program put forward by Prime Minister Abadi, and issues related to governance in Iraq. Some of these issues will be difficult to address in three months and indeed have been outstanding for years. But releasing salaries for KRG employees can happen quickly as a confidence-building measure. It is an important political development that Iraq’s cabinet was formed before the September 11, 2014 deadline passed. This will allow for an opportunity to re-inject legitimacy into the political process. It is further important that this government was formed while ISIS still controls significant urban areas in Iraq such as Mosul, Tikrit, and Fallujah. Nevertheless, the formation of the government also poses difficult challenges, particularly given Ameri’s candidacy for either the defense or interior ministry. Ameri’s assumption of either position will provide the Iranian government with greater access into Iraq’s formal security structures. 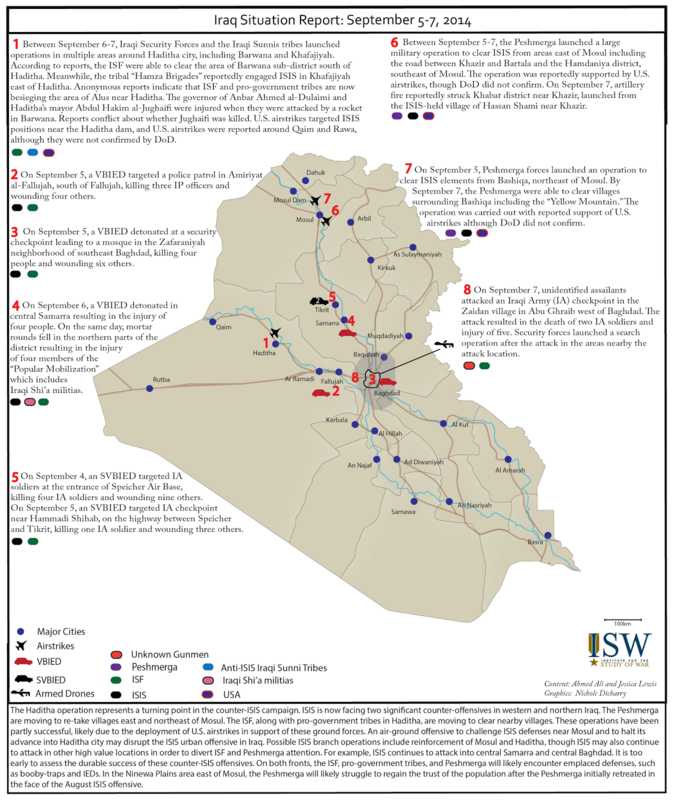 Moving ahead, it will be vital for Iraqi Sunnis in ISIS-held areas to perceive the government as representative. This dynamic, coupled with a revamped military and security strategy, can provide an opportunity to weaken ISIS. 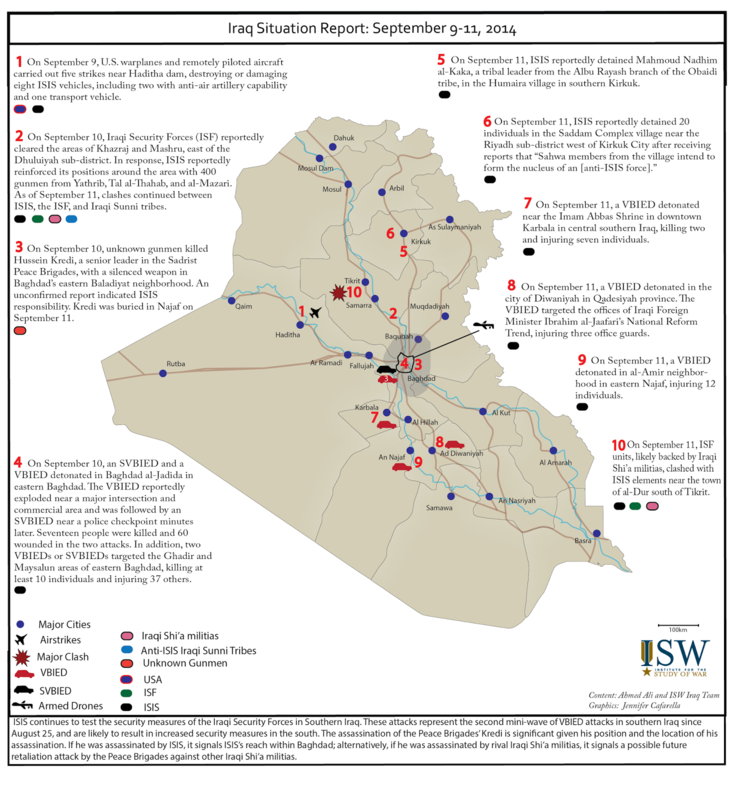 It is still early to see how this new government will be received, and ISW will continue to up-to-date analysis of the challenges facing Iraq’s new government.